A NAAS woman has been honoured with a prestigious national award for her 40 years of service in nursing home care. 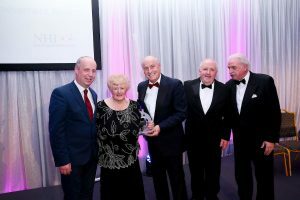 Ellen Dillon of Larchfield Park Nursing Home in Naas was awarded the Lifetime Achievement Award at the recent Nursing Homes Ireland Care Awards. Ellen and her family have been providing nursing home care to the people of Naas and beyond at Larchfield Park since 1977. She has played a distinguished and pioneering role in advancing and representing the private and voluntary nursing home sector in Ireland and was a founding member and served as a chairperson of the Irish Registered Nursing Homes Association. In the early 1990s, she became chairperson of the Federation of Irish Nursing Homes and has been a lead activist within Nursing Homes Ireland (NHI) since its formation in 2008. Ellen was presented with her award before 400 representatives from the nursing home and older person care sectors at a ceremony in Citywest Hotel, Dublin on Thursday 15 November. RTÉ presenter Marty Whelan was MC at the event.